*BREXIT discount* Huge villa with 2 Pools, Football, Tennis, Cinema, Disco, BBQ! Modern party villa equiped with everything you can think of!!! BREXIT: in case you’re struggling about coming to our lovely country because of the brexit issue,,,don’t! Book with confidence because everything will end up just fine. We will offer a nice ‘brexit discount’ for the next bookings! Villa Portugal is perfect for the gathering of big groups. Families, friends, corporate events, party events. We also provide meals with a private chef or cook. Activities are also a possibility with transfers included. Why stay in a hotel when you can have everything you need privately? Let us know what’s the occasion and we will take care of everything in advance! Villa Portugal can accommodate up to 40 guests. We have a second villa located 10 minutes from our main villa that can accommodate up to 20 guests (subject to an extra cost). Considering both villas, we can accommodate up to 60 guests! Villa Portugal is located 30 minutes from Lisbon airport and 15 minutes from several beaches. Although our property can acommodate up to 40 guests, we also host smaller groups too. The price changes according to the number of guests staying. In any case, when rented, the property is entirly for one group only (not shared)! 1 SMALLER POOL (HEATED) - The smaller pool has seats for 15 persons and can be used by both adults and kids. It's subject to an extra cost and will be heated upon request. ALL MEALS: We can provide all 3 meals to our guests (breakfast, lunch, dinner) and also a professional BBQ service (all included). Special meals for vegetarians & vegans are also available. These services require advanced booking. CLEANINGS: We can provide daily cleanings. We highly recommend this service at least for the common areas. VIP ACTIVITIES: We offer all kind of activities and services for our guests, such as: hiring a private CHEF, Catering & take away services, professional staff for barbecuing, limousines, babysitting, wine tasting, boat trips, plane trips, horse riding, karting, dolphins watch, boat fishing, paintball, canoeing, diving, nature walkings, rally paper/peddy paper & many others. These services require advanced booking. We have extra individual beds that can be set according to our guests needs. There is a total of 5 double beds and 30 individual beds! My name is Fernando. I used to be a football player but now I'm retired and decided to build this oasis and share it with the world! I designed and built this villa from scratch for my entire family. Unfortunatly I spend most of my time out of Portugal and so I decided to rent it. I wish and hope that our guests will enjoy, cherish and respect it as much as I do. Infrastructure! This villa offers a bit of everything for everyone. Besides the villa itself we also provide a long list of activities that will hopefully help entertain our guests. 1) The check-in time is made after 4pm and the check-out until 10am. Kindly contact us for the possibility of early check-in and late check-out. 2) As owners, we are not responsible for any accidents occurred during our guest’s stay at Villa Portugal. It is our guest’s responsibility to carry appropriate insurance. 3) it's not allowed to smoke anywhere inside the villa, bar or disco. 4) In accordance with the Portuguese law, it is forbidden to make excessive noises after 10pm. Fail in respect this rule may result in loss of the damage deposit. 5) The heating of our Pool, A/C or central heating may be subject to an extra cost. 6) In case of booking cancelation there will be no refunds. 7) We may charge an extra fee in case there's need for a deep cleaning, after our guests check-out. 8) We reserve the right of not changing pre agreed quotes on the booking process. 9) We reserve the right of charging 100€/night for each extra guest staying at the villa, above the agreed on the booking. 10) We may require a refundable damage deposit before the check-in. In any case, our guests accept full responsibility over any damages caused to the villa or its contents. Chuveiro, chuveiro exterior, located between the disco and bedrooms 8 & 9. Hot water. Amazing long weekend for a Stag Do. Myself and 17 family and friends have just returned from an amazing time in this gorgeous Villa for my Brothers Stag Do. Everything right from the off was perfect from initial contact, very quick answering of questions, helping organise things and making sure that we had everything in place to make our stay special. As soon as we arrived at the Villa, a really helpful lady called Natasha greeted us for a tour and to hand over the keys. Like always, our flight was delayed but waiting until our arrival at 23:15 didn’t seem to be a problem for her. She organised a taxi for an activity that we had booked there and then for early the next morning too. Big bottles of water were already chilled in the fridge and the beer taps connected to kegs of Sagres (a must in our opinion) as promised by Fernando. The beer was topped up with a single text message within a few hours for a very reasonable fee. The Villa itself along with the gardens, pool area, football pitch and tennis court were spotless and we couldn’t fault any of the maintenance of the place at all. We enjoyed a BBQ organised by Fernando at the Villa, it was supplied, prepped, cooked and then cleaned up by Natasha and her lovely Mum and in our opinions was gorgeous and totally worth the money, another must in our opinion. We will certainly be considering the Villa as a family based holiday in the future. The Villa is 35 miles outside of Lisbon and you can book a taxi from one of the local firms for €75 each way for a seven seater minibus (depending on time of day), we found that it was much easier and slightly cheaper to use Uber to get back but these rates ranged like always with Uber by time of day and or how busy it was and whether you use UberX or UberLux from €45.50 - €82.43. for a 5 seater (including driver) car. With the Villa being a decent distant outside of Lisbon, we were unable to organise and Uber for our outward journey to Lisbon. Every one of us thoroughly enjoyed our time at the villa and would highly recommend it to any large group looking for somewhere with all of the amenities this place offers. We would like to thank Fernando, Natasha and anyone else who has helped in the back ground to help make this long weekend as amazing as it was. It was a true pleasure to welcome you and your lovely group! We had a perfect communication since day one which lead to a perfect outcome! Please consider our property as your home here in Portugal! 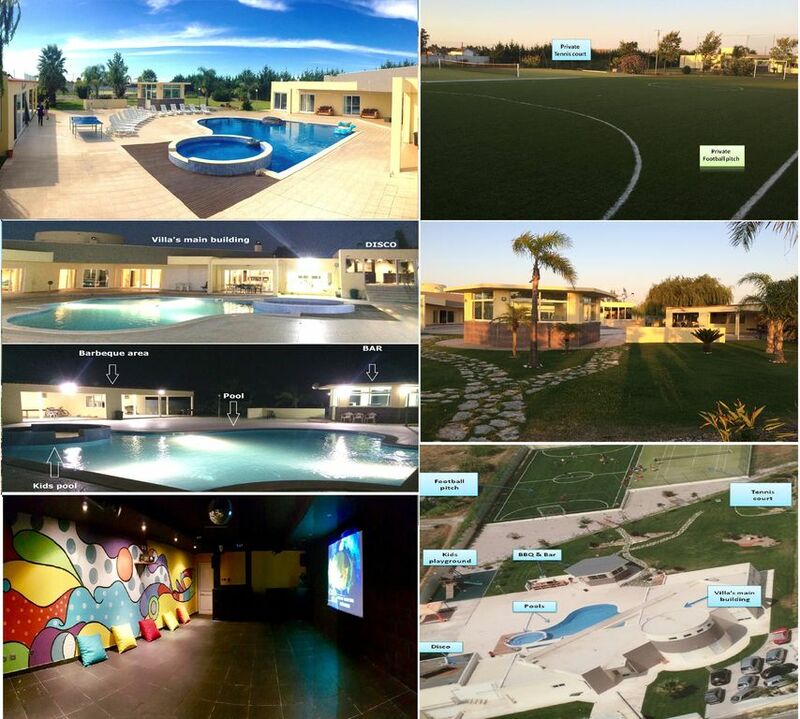 AMAZING property for team bulding events! This place is AMAZING! From booking it Fernando was really quick and helpful with responses as well as giving us some tips. He also helped us to arrange shopping to be in the house for when we arrived and were met by Natacha who showed us around and answered queries. When we were in the house the facilities are great, we had a large group of 20 people and they were all blown away with it and there was loads of space and plenty to keep everyone occupied. During our stay we went into Lisbon a few times and Fernando/Natacha helped to sort coaches and taxis for us. Highly recommend a stay here! Me and my family spent 10 memorable days in this marvelous villa. The villa is very beautiful, the house owners are very nice and helpful, the villa is 15 minutes away from the beach, even though the kids rather stay in the pool almost everyday. 2 minutes distance from local supermarket. we definitely recommend this villa! Just got back from a spending a week at Villa Fernando with a group of 18 and felt compelled to write a review about how amazing the experience was. Even prior to arriving at the villa, Fernando promptly responded every single query and even last minute requests to changes the booking numbers were handled with no fuss. There were quite a few birthdays during our stay and Fernando even threw in a birthday cake, some champagne, wine free of charge. We also had a complimentary key of chilled beer waiting at the villa , which was very handy for the sunny weather. On arrival the villa was clean and spacious with immaculate gardens / lawn and we were shown around the lovely facilities at the villa. One of the many highlights of staying at the villa was the amazing breakfasts and bbq dinners cooked by Odetta and Natasha. The variety of the meals and ingredients were of amazing quality and cooked to an exceptional standard. We requested some changes to the standard menu and these were accommodated with no questions asked. These ladies also help with most of our food shopping , so a huge thanks once again ladies. Also a mention to the lovely lady neighbour rearing chickens who gave us 2 eggs when we realised we had run out of eggs and wanted to makes pancakes and didn't fancy the trek to the nearest supermarket. On a final note one of the travelling group forgot her purse at the villa and the team were able to locate this promptly and Fernando kindly offered to post it down at no cost. So Thank you Villa Fernando for an amazing holiday and giving us some lovely memories that will no doubt stay with us for a long time. Thank you very much for your kind review. It was a great pleasure for us to welcome you and your lovely Family in our villa! I only hope to welcome you again in a near future. Many thanks again in my name but also Odete and Natacha! There were 22 of us, 13 adults and 9 children. This property was perfect in every way apart from its rural location. We were here for 10 days and there was so much for the kids to do there from playing football or tennis, pool, table football or the PlayStation if they weren’t in 1 of the 2 swimming pools. Natacha who looks after the Villa was brilliant, we had a problem with a leak and no hot water in the kitchen and someone came the next day and replaced the tap. We couldn’t get the controllers to connect to the PlayStation so she arrived with 2 brand new ones within the hour. Any problems we had she was very quick to get them sorted and also offered recommendations for restaurants and to book them. Overall an excellent stay in a lovely villa.